The W.A.G.R. had a total of thirty-eight A class horseboxes of three different types. 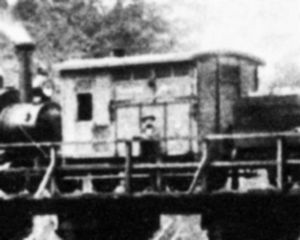 The first group (later A5105 - 5114) were built by the Metropolitan Railway Carriage and Wagon Co. in three batches of two, two and six in 1882, 1891 and 1893 respectively. 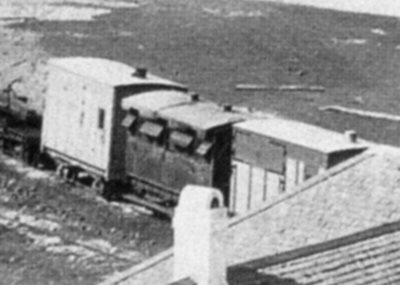 The enlargement from an old photo of Fremantle shows two of these early horseboxes, one either side of an AI class carriage. Both are clearly painted grey with the right hand one definitely having its ironwork picked out in black. This horsebox is one of the MRCWCo type. The left hand horsebox may be cleaner or (because the vehicles are on a curve) at a sufficiently different angle to the sun so that the louvres in the upper body side don't show so clearly. It belongs to the second group described next. The second group were the N.Z.R. design which appeared on the W.A.G.R. in 1896 when a batch of twelve (later A5115 - 5124) were received from Bristol Carriage and Wagon Co. A second batch of twelve (later A5125 - 5138) came from the Lancaster Carriage and Wagon Co. in 1897. They were gradually modified over the years losing some of their similarity to their NZR cousins in the process. 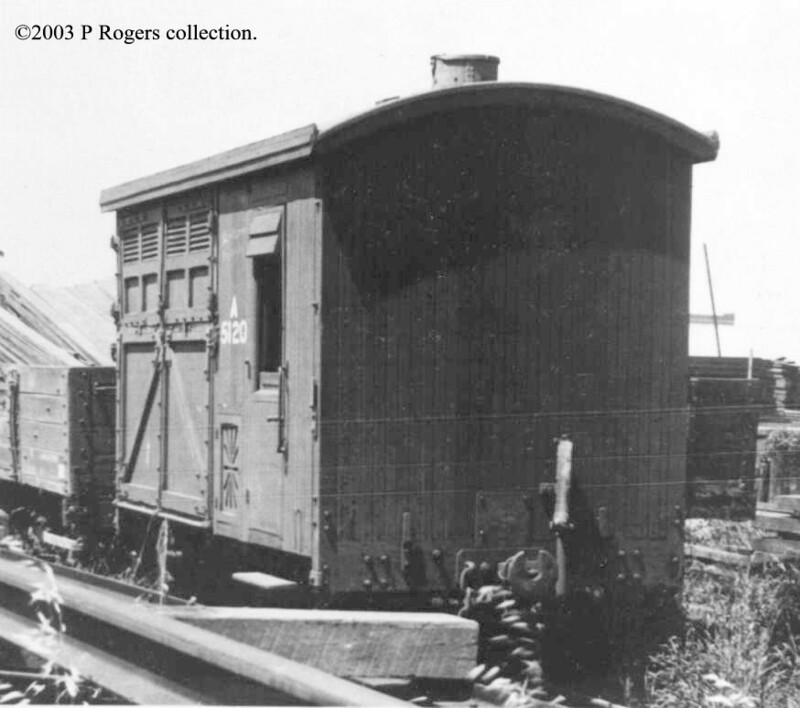 The drawing shows the original condition whilst the photo shows one near the end of its days with replacement lower horse compartment door and modifications to the roof. The third group in class A were the four ex G.S.R. horseboxes (A5139 - 5142) which unlike the other two types were only 14' long. The G.S.R. type was also used by the M.R.W.A. as their class H and later HM but the G.S.R. classification is not known. These four horseboxes came into W.A.G.R. stock in 1896. The blurry enlargement at right shows a G.S.R. horsebox about 1896 still in G.S.R. grey livery. 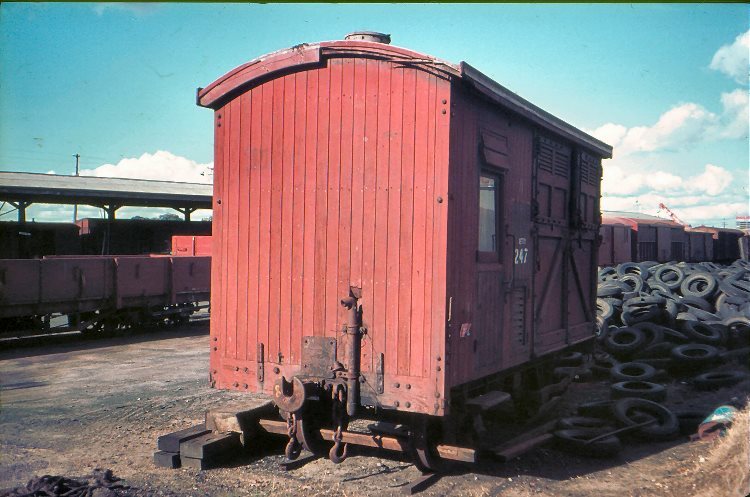 It is just possible to discern that it has white "Great Southern Railway" lettering on the upper doors of the horse compartment. The GSR horseboxes were noticeably shorter than the other types and had a roof that overhung the sides. Before the 1900 reclassification and renumbering, all of the A class horseboxes were class E and were not included in the wagon stock list. The N.Z.R. type horseboxes were probably E11 - 34. In 1937 A5105, 5108 -5110, 5112, 5114, 5122-4, 5127, 5131, 5133, 5134, 5138, 5142 were converted to BS class cattle wagons. A further nine (A5116, 5119, 5120, 5121, 5126, 5128, 5129, 5130, 5132) were rebuilt as D Class vans in 1943. A5115, 5117 and 5136 became D vans in 1951. The remaining horseboxes were written off in 1954 (A5135), 1955 (5125, 5137) and 1958 (5118, 5140). The remains of 5118 and 5140 became jetty wagons 246 and 247 in 1962. They were used for "Goods receival" at Fremantle. Eventually Jetty 247 was used for storage purposes off the rails at the Weedex Siding in Perth Goods yard. Apart from 5118 and 5140 all other W.A.G.R. horseboxes were written off by the end of 1955 and it is possible that this pair had been in use as jetty wagons for some time. Closer inspection of the photo of Jetty 247 shows that this was NOT a GSR type horsebox and is likely to have been one of those written off in 1954 or 1955. Jetty 247 at Perth. Definitely not a GSR type horsebox. More likely to have been 5125, 5135, or 5137 written off in 1954 or 1955. All of the other two-letter "A" codes were used by carriages and so when new horseboxes were constructed there was a bit of a classification problem. This was resolved by putting all of the later horseboxes into the "B" group. The W.A.G.R. 's later horseboxes were the six BA class bogie horseboxes of 1903 and the eleven BB class large 4 wheel horseboxes built from 1907.